Mesa, AZ 09/12/2018 – The World Record Academy today Awarded Dr. Greg J. Marchand a world record for performing hysterectomy through the smallest incision ever. The surgery involved removal of a uterus, ovaries and Fallopian tubes all through an incision the diameter of a AAA battery. The record was awarded after a lengthy verification process performed by the academy to verify the results. The patient, Mary Coble, provided the Academy with pictures of her belly from 4 weeks after the surgery. There was no scar visible whatsoever. Ms. Coble had suffered from debilitating pelvic pain from endometriosis and adenomyosis for years before being recommended to have the hysterectomy after other conservative treatments for her pain were unsuccessful. She assumed she would be having the hysterectomy through the same incision that she had her cesarean section went through, which was a lower abdomen horizontal incision, often referred to as the “bikini cut.” She states she was surprised and delighted to find that the procedure was able to be perf ormed through only a tiny incision in her umbilicus. Description of Technical Procedure Performed: Successful Single-port Total Laparoscopic Hysterectomy with bilateral salpingo-oophorectomy and lysis of adhesions secondary to scar tissue from a prior cesarean section. The procedure was performed using an Olympus Tri-Port device using a modified technique through a smaller incision. The incision and abdominal entry was performed using an Ethicon 11mm blunt tip trochar in order to be sure the incision was exactly 11mm, and that the procedure was reproducible. A 5mm 30 degree laparoscope was used with wavy graspers, a bovie laparoscopic extender “hook,” and a Covidien Ligasure Blunt Tipped 5mm device. Our technique was successful in a difficult case that required dissection of scar tissue from a previous cesarean section, and also entailed scar tissue secondary to endometriosis. Unfortunately, some clinical scenarios involve worse pathology and may require a traditional laparoscopic or robotic assisted laparoscopic hysterectomy in order to be completed. 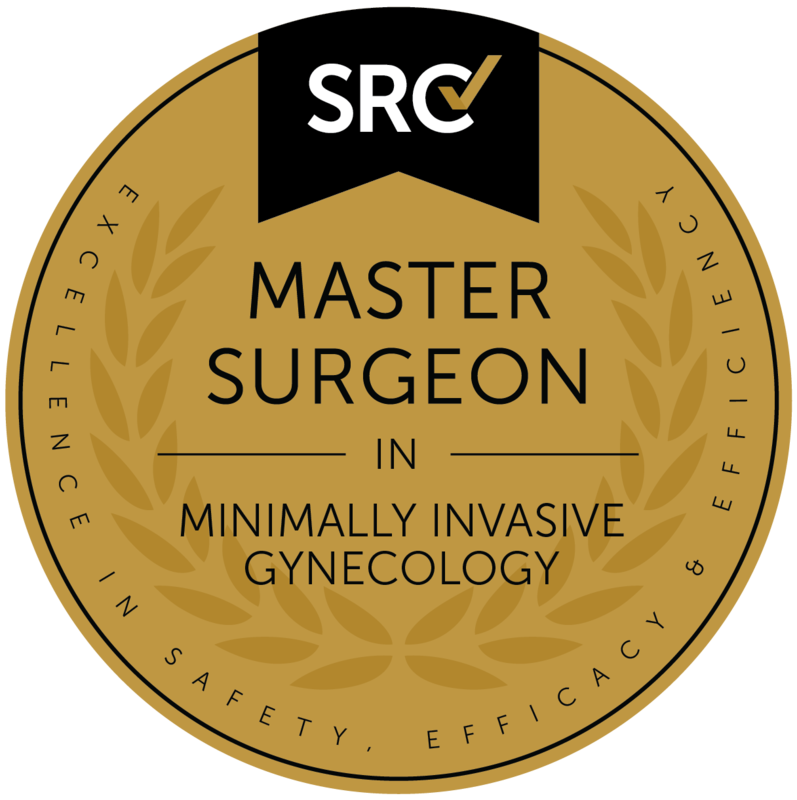 We feel our technique is a valuable weapon in a surgeon’s set of surgical skills but does not constitute a solution for every patient requiring a hysterectomy. The Marchand Institute for Minimally Invasive Surgery is a research and educational not-for-profit corporation and functional “Think-Tank” for the advancement of Minimally Invasive Surgery. We are located in Mesa, AZ. Our efforts are split between the publication of high-quality medical research, expert level surgical education, and involvement in clinical trials related to advancing Minimally Invasive Surgery. Did this record involve “morcellation”? What do Dr. Marchand’s accreditations mean ? Why is this a world record? Can’t a hysterectomy be done with no abdominal incision at all? Yes, a hysterectomy can be performed vaginally without any abdominal incisions at all in uncomplicated cases without significant pathology. A completely vaginal approach, however, gives a very limited view of the abdomen and makes it difficult to deal with abdominal pathology such as scar tissue from prior surgeries and scar tissue from endometriosis. This can increase the chance of complications and injuries to surrounding organs. Using our technique we were able to directly visualize the abdominal cavity and perform the hysterectomy with less risk of complications. This was demonstrated by our ability to complete the hysterectomy safely despite this patient’s history of prior cesarean sections and endometriosis. Our technique also has excellent cosmesis using only an 11mm incision that leaves essentially no scar.